In stock 40 items in stock. Gone are the days that you have to worry about silicone water proofing splitting and breaking on you! 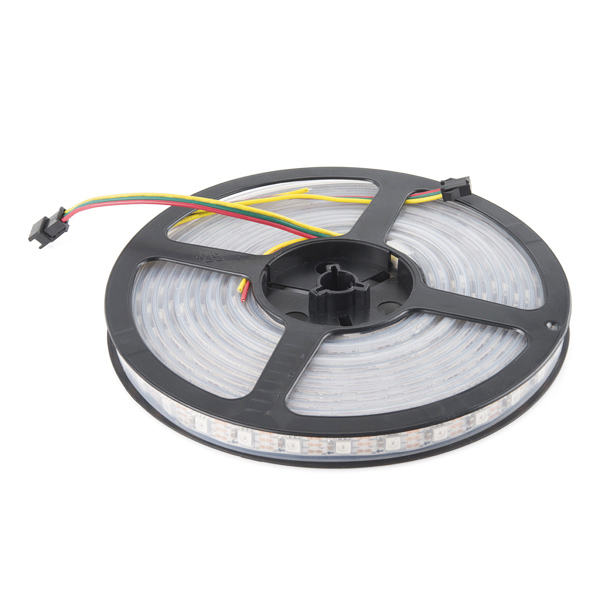 These are sealed addressable 5 meter long 5V RGB LED strips that come packed with 60 WS2812s per meter. 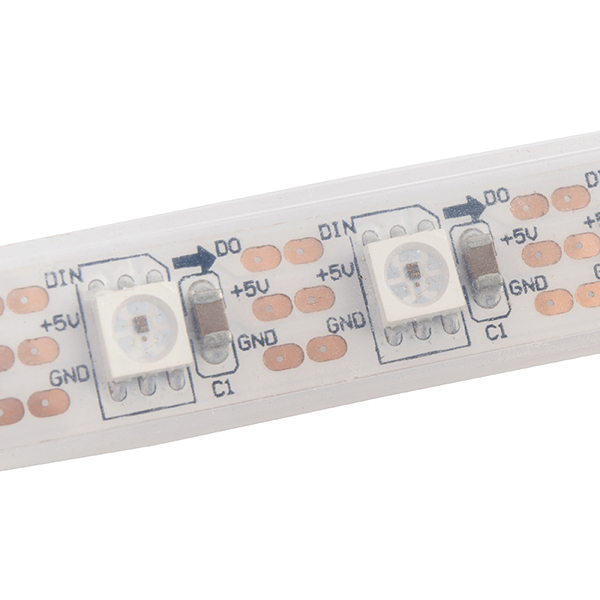 Each of these strips are enclosed by a flexible silicon jacket with an IP65 waterproof rating to protect your precious WS2812 LEDs. You will be able to control each LED RGB individually giving you the ability to create cool lighting effects for your car, fish tank, or perhaps under cabinet lighting in your kitchen! These are approximate dimensions. The flexible PCB is about 9.99mm wide and 1.83mm in height from the bottom of the flexible PCB to the top of the LED. 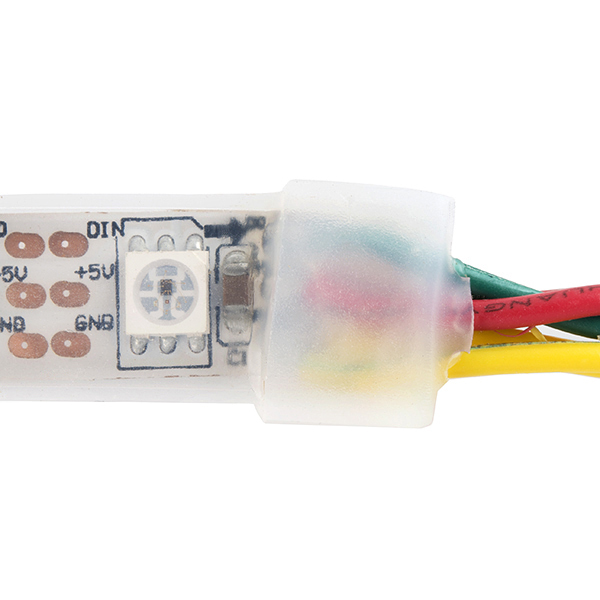 With the LED RGB strip in the sealed silicon weather proof material, it is about 11.93mm wide and 3.48mm in height. Hello! I am very much a beginner with LEDS. I feel very comfortable using individual LEDS after completing the tutorials for using LEDS in etextiles, and I really think this particular product will be perfect for my next project. I am also thinking that this may be incredibly ambitious for someone so new to programming and wiring. I'm afraid the questions I'm having may seem painfully obvious to everyone else here, but I'm going to ask them anyway! 1. I saw someone else asked if these strips can be shortened. After it's cut, can you still use the remainder? 2. What sort of power source would you recommend for an etextile project, something that will be used in a dress and will need to be concealed on the innermost layers of fabric. 3. Would it be possible to have separate layers of fabric, one on top of another, each with strips, without creating a short? So with all of these set to full on all 3 channels each segment is pulling 60mA. This means that the strip is pulling 5m * 60 segments per meter * .06A, this is 18A. What is the best way to power these things? I've had WS2811 strips (predecessor of the WS2812) from different suppliers in the past and each had a different weight copper on the flex PCB. In the thinnest weight there was a noticeable change in colour along the strip when they were all set to white. I ended up running some thicker cable along size the strip and tacking it to +5V and Gnd every 50cm or so. It would be nice to know the copper weight and trace dimensions of these boards so that the voltage drop over 5m can be calculated. I also wonder how these insulated strips would handle heat dissipation (mine were not insulated). That said, the strips are great if you're using them for animated feature lighting where you don't have to run them at full brightness. Edit: apparently the WS2811 is the constant current controller in the WS2812 LED module. Ok sweet. I was considering buying these last night, but the thought of 18A scares me a little. I don't want to blow out a $100 part. So I was looking at getting a couple of these for some projects..
Is there a power supply here or Adafruit that I would buy for these.. I could also buy terminal to barrel connectors as well.. any suggestions would be wonderful! Even though I'm supplying plenty of current to a 300 LED strip, the Arduino has trouble pushing the data signal to more than about 150 of the LED's. I am considering using a MOSFET to amply the signal, but I would have to use a top-loaded circuit. Anybody have any experience with this? The linked datasheet says the "input voltage" which I'm assuming is DIN, the control signal, can be -0.5~VDD+0.5. Does this mean I could control these lights with a 1.8v signal as long as I provide 5v for VCC? What would a good battery be to run this? A car battery? But seriously though, the full 5 meters will require several amps (one comment noted they measured 10A). This is not typically a product that you would power with a battery. You may be able to find some suitable batteries in the remote controlled cars/heavy planes domain if you really, really had to. I've got 430 of these things running full bore (RBG @ 100% = white) and at 5VDC and it pulls around 10A. So, yes, you totally need to run supplemental copper in order to get enough power to all the components. Well that's a bummer. If you have to run your own wiring along every strip, what's the point of buying the sealed version? I can confirm that this 5M strip cannot be fully brightened while only fed 5V from both ends. In other words, if you want to go above 25% brightness across all LED's your going to have to splice some power points along the strip. At 50% brightness, the voltage at 2.5M is around 3.8V and the LED's no longer can reliably read/transfer the data stream resulting in "random" colors along the strip. 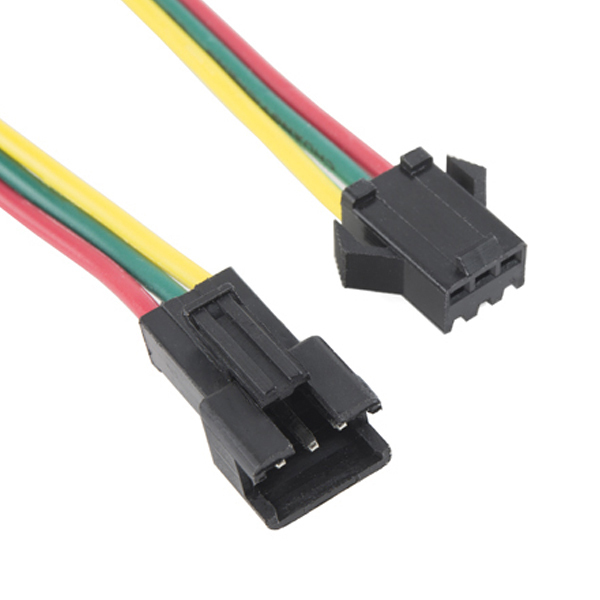 Also, check your JST connectors if cascading more than one strip because my output side was miss-wired yel<->red which is not good for the electronics, especially when driving with a >10A power supply! 18 amps seems like a lot for those tiny little leads. I worry about a fire. Can someone please correct me if I'm just being too worried? Also, is there a common power supply people are using to drive this? I would rather not reinvent the wheel and fiddle with the power supply. Does anyone have any thoughts? Is there a good solution to driving all these? Thanks!! I ended up buying some 30A 5V power supplies (and very happy with them) PS1-150W-05 from circuit specialists. I also put automotive fuses on the power lines to protect against shorts. Eventually I will add a current sensor and relay to have the arduino shut things off if the current spikes over the normal. The strips can get warm to the touch when driving at full brightness even when powered at the start and end of the strip. Voltage drop into the center is just a bit under 4v, so Ideally I think you would power ever 2.5m. I used mine in a lot of animations so they rarely were at full brightness so I didn't worry about them. I would like to see the JST connectors for these offered as a separate product. I know it is a three pin but I do not know other than that. Maybe there is a pigtail that could be offered. The pixels on these keep blowing out one at a time after a few hours. Does anyone know why? I didn't buy them from sparkfun but adafruit but they are identical. I've checked my circuit configuration a hundred times (It only needs like 4 wires and I still double, triple checked.) I checked voltage level everywhere and no place had strange voltage reading. I added a 330, then 660 ohm resistor at the data-in line, tried different data-pins, and tried increasing capacitance across the input voltage up to 1480 uF. They work for a few hours then the first one always go out. Then I have to cut and resolder the wires. I've lost 6 pixels out of my 1 meter, 30 Led/meter strip from adafruit. No one seems to know why these are blowing up. Is it possible to cut the strap if I only need like 10 leds? Yup! Just be careful to cut cleanly so you don't create any accidental shorts. What do you mean? How do you create short by cutting? If you do not cut cleanly and end up with strands of traces hanging off, you could potentially short the 5V pad to the GND pad. Basically, cut the pieces, don't saw them apart. It is possible to connect two 5M Strips together (10M)? And can I still control each LED RGB individually then? Yes, and yes.. though there are some limitations because eventually you run into timing issues depending on your needs. For an example calculation, see Stefanibus on LED - SMD RGB (WS2812). What is the 2 wire power connector used for since there are power lines included in the 3 pin connector? Do both sets of power need to be connected? It's in case you want to use an external power supply and just use a (low power) controller (like an Arduino) to send the color data. You'd want to do this if you have a longer length of the strip. See also this separate product video (this is different from the one linked to in the product description and discusses the separate power supply and demoes the strip). Ok what is like the best way to power these things. I ended up just throwing a power connection on each end and feeding it from a 20A (overkill) 5v supply. I have a question.....So there's 60 LEDs per meter, and you get 5 meters in this strip, which comes out to 300 LEDs. However, isn't it standard for I2C to only support up to 8-bit addresses? If that's true, you can only address 255 LEDs individually (256 minus address 0). The only way to support all 300 LEDs is if the WS2812 can support 9-bit addresses, but I can't find any mention of the address size in the datasheet. Does anybody else have any information on this? The data transfer protocol use single NZR communication mode. After the pixel power-on reset, the DIN port receive data from controller, the first pixel collect initial 24bit data then sent to the internal data latch, the other data which reshaping by the internal signal reshaping amplification circuit sent to the next cascade pixel through the DO port. After transmission for each pixelï¼the signal to reduce 24bit. pixel adopt auto resha -ping transmit technology, making the pixel cascade number is not limited the signal transmission, only depend on the speed of signal transmission. Yeah, these strips are so much nicer to work with :) I can only imagine that the next major WS28* will be one with a tiny microcontroller built-in where you don't just push LED values but actual program data down the line. Fully stand-alone dynamic LED light strips - where do I sign up?